In Windows systems, all programs install on the system drive by default. Do you know why Microsoft insists us to keep all software on the default drive? The programs we installed, work in connection with Windows operating system. C drive is the default location for OS. So we should install other apps on the same drive normally. If path changes, you may face system lag or troubles in some software operations. However, lots of users prefer to save apps in other locations because of low space in C drive. If you decide to change, follow these steps. Open Run (Win + R) or Cortana and type Regedit in the search box. Do you know which is the installation path on your system? If you’re using a 32-bit system, the default path will be C:\Program Files. For 64 bit systems, the path should be C:\Program Files and C:\Program Files(x86). in the rightside window. Double click on it. A small box will open with Value name and Value data fields. Type your new installation path on the second field followed by the drive letter. It should look like this, D://Program files. Click OK to save the changes. From now onwards, all programs will be installed on the new path. But be aware that some app operations may not work properly because of this path change. Moreover than that, default apps function won’t work with programs installed on other drives. For instance, you have two office apps on the system out of which, one is installed on C drive and the second one is on D drive. You can open a doc file with the first app only (by double-clicking). If you want to open it with the second program, follow these steps. Windows 10 users can change the path easily. Open Settings from Start menu or by asking to Cortana. Go to System > Storage to get the options. Scroll down until you see Save locations settings. 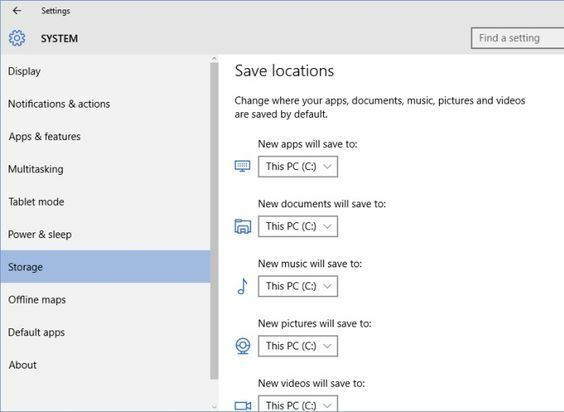 Here you can set the default save locations for apps, documents, music, pictures, and videos. All new files will be saved to chosen drives by type.